16 classmates and 3 wives gathered at Yang Ming-sheng's house-蘿莎會館 in Feb, 2014(?) Picture taken and supplied by 劉伯欽. A mini-reunion to welcome 蕭正男 to the Bay Area from Rochester, NY (for good) was organized by 李南雄 on 8/22/12 Saturday at San Francisco and attended by 蕭正男(澄子), 高政治(淑慎), 李南雄, 劉舞侯 and 賴昭正. Here is what 李南雄 wrote afterwards: "After two years, this was the first mini-reunion among classmates who live in the Bay area. Much appreciation to those who could make it to attend and to prove to each of us that we are in good health. It was wonderful CC and JN each brought their better halves along. It is a big job for JN and family to move from the East to West coast across American continent. CC is admirable to start his new venture, making us feel his vitality and spirit of entrepreneurship. George was able to come and at very end he did not miss his Badminton session. Ha! Ha! Frank always has a pocket of interesting stories for us anytime. While chatting, we did remember Gilbert and Lin and talk about them too. Lin and Gilbert, didn't you feel that your ears were itchy yesterday? I am looking forward to another occasion when we gather together again." A mini-reunion was held at Taipei welcoming IK Wu and Jen-nan Shau on 11/12/2011 attended by 江盛雄,林正一,蕭正男,吳毓剛,劉伯欽,張崇淵,陳金海,古萩雄,陳椿雄, and 馮道國 (news provided by 劉伯欽, picture by 張崇淵). Welcoming dinner party for 李南雄 (Peter Lee) in Taipei on March 20, 2011 held in Living Restaurant of Ching Cheng Street. 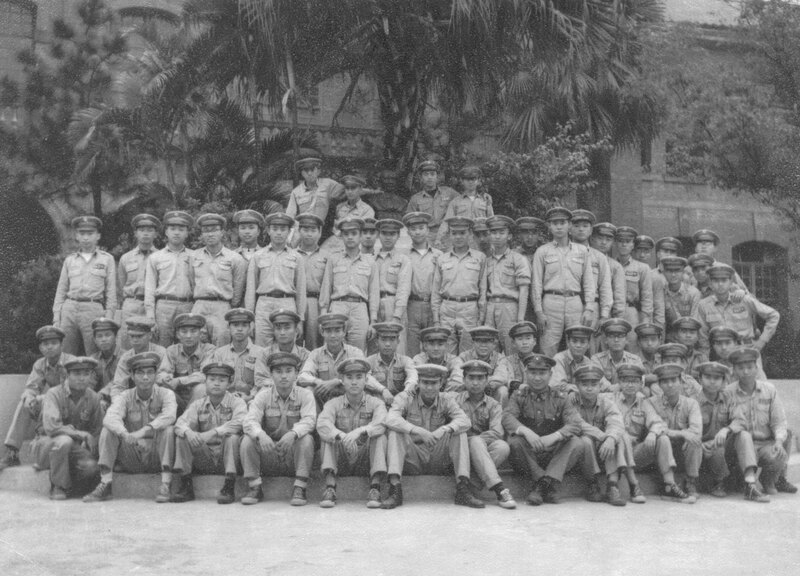 Almost all except 劉伯欽 (Po-ching Liu) were classmates of Chien Guo Junior High Class 6 of 1956. Kun Ti's Memorial Service report from CCKao: This is a brief report to you All about the Memorial Service today for our classmate Chen Kenny KunTi (陳坤地). Now that KunTi has left us, there are now 6 classmates remaining in SF Bay Area.On behalf of the entire 6th Classroom of Class 1959 of ChianKuo Senior High School (建國中學1959級6班), five of us attended the Memorial Service:Lie George ChaoJang (賴昭正 with wife Thelma), Liu Frank WooHoe (劉舞侯), Liu PoChing (劉伯欽), Wu ChunLin (吳春霖), and Kao ChengChi (高政治). We missed only Hong Gilbert HweiKwan (洪惠光) who is out of town in Shanghai. Here is a scanned image, in pdf format, of the Memorial Service pamphlet in loving memory of Chen Kenny KunTi (陳坤地). Also, FYI, the couplet that Lin AnChing (林安慶) had prepared was displayed at the front of the chapel for the service. We are all shocked and saddened that KunTi left us, so suddenly. Please Komi (郭香美) be strong. Wish All classmates be healthy forever. Oct. 22, 2010 Following is a sad news from 陳坤地夫人(Komi). Hello friends, I have sad news to share. Kun Ti Chen passed away in San Jose, CA on Tuesday, October 20th due to a heart attack. While attempts were made to resuscitate him, they were not successful. We would appreciate it if you forwarded this message to other classmates that knew Kun Ti on behalf of our family, as we don't have the complete list. I am checking email occasionally if you need to reach me. For the time being, I am staying with my sons in Belmont and Foster City. (For local Bay Area residents, we will let you know when the memorial service is as soon as we schedule it.) We know your thoughts and prayers are with our family during this difficult time. Thank you. Memorial service will be held on Friday morning (October 29) at 10 am to celebrate his life and commit his spirit to God at Cypress Lawn Funeral Home, 1370 El Camino Real, Colma, CA 94014-3239 (phone +1-650-550-8808). Lunch will immediately follow at 12:30 pm. Kun Ti Chen is survived by his wife Komi and two sons. His family asks that you make a donation to your favorite charity instead of sending flowers. May 27, 2010 Mini-Class Reunion held at Palo Alto, CA; attended by (standing from left to right) 劉舞侯, 賴昭正, 吳春霖, 高政治 (seated from left to right) 陳坤地, 陳旺灶夫婦, 高政治夫人. At our ages, the chat invariably turned to health related topics, particularly with the presence of a doctor (陳旺灶). Paul Po-Yuan Chen 陳柏源 paulyuanchen@verizon.net Seal Beach, CA ?
? or ??? indicates unconfirmed or incomplete. Please let Chao-Jang Lie know if you have any comfirmed/complete information about them.